The 2-year M.F.A. in Screenwriting is an intensive program designed to encourage the development of your unique storytelling voice through the exploration of the intricacies of story structure and character development. Working under the mentorship of industry active screenwriters, you’ll learn to write content for the screen in a variety of mediums including short and long form projects, episodic television and emerging media. Additionally, as a student in the M.F.A. Screenwriting program, you will study the “business of the business” - the practical side of developing and selling your ideas. Students enrolled in the program also have the opportunity to collaborate with their film production colleagues to have one of their scripts produced for the screen. 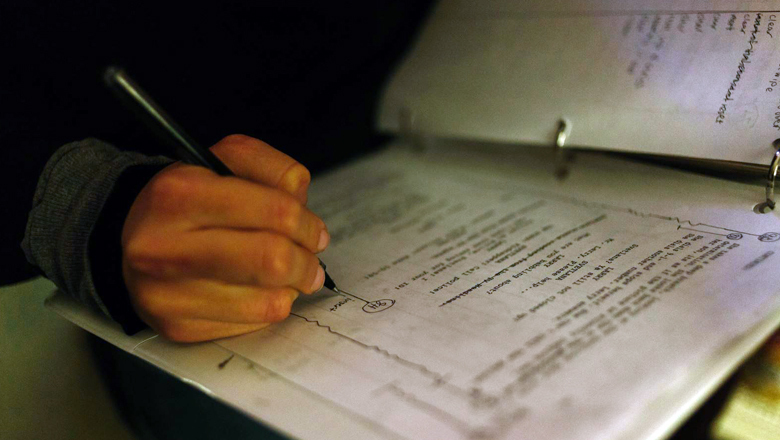 Upon graduation, you’ll have an understanding of how the industry works as well as several developed scripts. Identify, create and write fully dimensional, complex, and dynamic characters. Write screenplays that demonstrate a distinctive personal voice in a variety of formats and genres. Write short and feature length screenplays which demonstrate effective storytelling craft and narrative structure for a variety of genres. Apply the theoretical concepts to the creation of distinctive and original screenplays. Successfully complete a thesis screenplay. The following sequence of courses prepares students for successful completion of the thesis screenplay. The courses must be taken in the following order, during the semesters indicated. Any deviation must be approved by the film division chair. In order to apply to the Screenwriting graduate program, you must submit the required application materials, as well as a Creative Supplement. The application will go live in July, and more instructions on the application process will be updated on our website soon.